THE ALBANY LETTER- ANOTHER OFFERING FROM THE S.L.A? In the last article we focused on the 1978 Channel Nine letter as a product born from the Symbionese Liberation Army, and highlighted the very real possibility that all the 1974 'Zodiac' communications were in fact authored by people connected to this militant organization. We discussed how the Symbionese Liberation Army specifically targeted the Hearst Corporation, not only by the kidnapping of Patricia Hearst on February 4th 1974, but by mailing the S.L.A. letter on February 3rd 1974, along with the subsequent Badlands and Red Phantom correspondences, all of which were designed with the Hearst family in mind. But it doesn't stop there. The Channel Nine letter stated "You people in LA are in for a treat. In the next three weeks you are finally gona have something good to report. I have decided to begin killing again". The August 1st 1973 Albany letter began in similar fashion: "You were wrong. I am not dead or in the hospital. I am alive and well and I am going to start killing again". This familiar trope of the Symbionese Liberation Army mimicking Zodiac correspondence may have possibly extended through a five year period, from August 1st 1973 to May 2nd 1978. The widely questioned Albany letter, I suggest, is another letter penned by this militant group for one specific reason - their hate of corporate greed and the Hearst family's apparent stranglehold on the narrative through their newspaper collective. The biggest question that has to be asked regarding the Albany letter is, why would the Zodiac Killer randomly pluck the Albany Times Union newspaper out of a hat when choosing to write his first correspondence in nearly two and a half years? What connection did the Zodiac Killer have with this newspaper? Many have put forward the notion of Richard Gaikowski and Darlene Ferrin as a connection, but this is a real stretch four years after her death. The Albany letter arrived at the Times Union only five months before the sequence of 1974 letters - it has been argued - were a subtle rebuke of the Hearst Corporation. So why should this correspondence be any different. The Symbionese Liberation Army had every reason to target this Hearst run newspaper, and may explain why it was chosen, despite being nearly 3,000 miles away from San Francisco. 'The Times Union is an American daily newspaper, serving the Capital Region of New York. Although the newspaper focuses on Albany and its suburbs, it covers all parts of the four-county area, including the cities of Troy, Schenectady and Saratoga Springs. It is owned by Hearst Communications. The paper was founded in 1857 as the Morning Times, becoming Times-Union by 1891, and was purchased by William Randolph Hearst in 1924'. Wikipedia. George Randolph Hearst III (born 1955) is the Publisher and CEO of the Times Union newspaper in Albany, New York, and a director of the Hearst Corporation. He is the second child of George Randolph Hearst, Jr. and Mary Astrid Thompson and great-grandson of William Randolph Hearst. Hearst was previously the Director of Operations of the Times Union and then its Associate Publisher and General Manager. He is the chairman of the board of trustees of the Albany Institute of History & Art, a member of the board of directors of the Saratoga Performing Arts Center and St. Peter's Health Care Services, a hospital in Albany. The threat issued to the Albany Times Union newspaper was the forerunner to the attack on the Hearst Corporation in at least three of the four 1974 communications, that sandwiched the kidnapping of Patricia Hearst on February 4th. Below are some communications mailed by the hand of the Symbionese Liberation Army to New York, including Columbia Broadcasting System (CBS). When we consider the identity of the author of the July 8th 1974 Red Phantom letter, we have to consider the person they are addressing and what do they stand for. The letter states "Editor: Put Marco back in the hell-hole from whence it came- he has a serious psychological disorder- always needs to feel superior. I suggest you refer him to a shrink. Meanwhile, cancel the Count Marco column. Since the count can write anonymously, so can I----the Red Phantom (red with rage)". ​The obituary of Marc H. Spinelli began with "Marc H. Spinelli, better known to Chronicle readers as Count Marco, a columnist who gave outrageous advice to women for 15 years. As Count Marco, Mr. Spinelli was a star performer in a circulation war in the 1960s between The Chronicle and other Bay Area newspapers. At the height of his fame, he wrote his newspaper column, appeared on his own daily television show, wrote three books, won prizes and developed a huge audience that was either amused or appalled by his words" sfgate.. Most of the people dissatisfied with his newspaper column were disgruntled women, appalled with his views they deemed as male chauvinistic and sexist - so a good case can be argued that the author of the Red Phantom letter was likely a woman fighting for women's rights, upset by his perceived superiority complex. On the flip side, it could be the Zodiac Killer angered by the columnist for putting women down, despite the fact he had no problem murdering them. His book 'Beauty and the Beast' was littered with distasteful comments towards women, such as 'Someone once asked me, "do you really believe a husband should beat his wife?" And I answered "Yes, most emphatically. There are times when she should not only be beaten, but kicked when she's down". Other examples can be readily found in the newspaper columns running up to the Red Phantom letter of May 8th, shown here in the 'Ten Days of Count Marco' by Zodiac researcher Michael Cole. Two such examples are "Female comics, she says, must play the role of ugly duckling or half-wit in order to get laughs. The real uglies of course are the ones who don't make a living at it: the average American housewife who prowls the public streets with her hair in rollers and her stretch pants defying all laws of container control" and "Besides, if a stewardess can't handle a flippant male passenger, then I don't think she's strong enough to open an emergency door". So, it wouldn't be too surprising if the author of the Red Phantom letter was a woman with aspirations of equal rights and respect, who was familiar with the San Francisco Chronicle newspaper and despised the views of Count Marco, rather than a serial killer known for stabbing women in the back, and widely portrayed in many Zodiac circles as a man who vented most of his anger towards the women he encountered. This dichotomy, however, is largely disregarded, when the overarching desire is to believe the Zodiac Killer resurfaced in 1974 for phase two of his 'escapades'. Having previously poured huge doubt on the February 3rd 1974 S.L.A letter as Zodiac material (likely authored by a female member of the Symbionese Liberation Army), and questioned the authenticity of the Badlands or Citizen card, we shall now examine the Red Phantom letter from a similar perspective. We shall also look at the origin of the anonymous signature "Red Phantom (red with rage)"
"The United Federated Forces of the Symbionese Liberation Army (SLA) was an American left-wing militant organization active between 1973 and 1975 that considered itself a vanguard army. The group committed bank robberies, two murders, and other acts of violence. In his manifesto "Symbionese Liberation Army Declaration of Revolutionary War & the Symbionese Program", Donald DeFreeze wrote, "The name 'symbionese' is taken from the word symbiosis and we define its meaning as a body of dissimilar bodies and organisms living in deep and loving harmony and partnership in the best interest of all within the body. "This political symbiosis DeFreeze describes means the unity of all left-wing struggles, feminist, anti-racist, anti-capitalist, and others. DeFreeze wanted all races, genders, and ages to fight together in a left-wing united front, and to live together peacefully". Wiki. The group mailed large quantities of mail to the San Francisco Chronicle, San Francisco Examiner, and various television and radio stations, as well as many other outlets. They ranged from demands and threats, to spouting off Symbionese Liberation Army doctrine. Their membership was progressive, having a high proportion of female members with a staunch feminist ideology. Therefore, bearing in mind the S.L.A letter, is it possible one of the female Symbionese Liberation Army members took umbrage over the Count Marco, San Francisco columnist's views on women and mailed a correspondence to him, telling him to get "back in the hell-hole from whence it came"? Or was the Zodiac having a mid-life crisis becoming more liberal with his views - rather than his bullets. Here is a small fraction of the literature composed by female members of the Symbionese Liberation Army and their struggle for equality in the sexes. The 'Woman Question' referred to in the FBI 'Hearnap' (Hearst Kidnap) files "is translated from the French term querelle des femmes (literally, 'dispute of women') refers both to an intellectual debate from the 1400s to the 1700s on the nature of women and feminist campaigns for social change after the 1700s. While the French phrase querelle des femmes deals specifically with the Renaissance period, 'the woman question' in English (or in corresponding languages) is a phrase usually used in connection with a social change in the later half of the 19th century, which questioned the fundamental roles of women in Western industrialized countries such as the United Kingdom, the United States of America, Canada, and Russia. Issues of women's suffrage, reproductive rights, bodily autonomy, property rights, legal rights, and medical rights, and marriage dominated cultural discussions in newspapers and intellectual circles. While many women were supportive of these changing roles, they did not agree unanimously. Often issues of marriage and sexual freedom were most divisive". Wikipedia. The Symbionese Liberation Army women members often referenced a "cell" or "collective", and this leads us nicely on to the meaning behind "Red Phantom (red with rage)". Many have searched for the inspiration behind "Red Phantom" from a Zodiac perspective. Comic designers, movie makers and newspaper editors throughout the ages have attributed pseudonyms to fantasy characters and murderers alike. In other words, they have just been manufactured by the imagination of the creator and not necessarily copied or inspired by something previous. The "Red Phantom" pseudonym may just have been conjured up on the spur of the moment. However, I would like to focus on the only word the author used twice - the word "red." If the letter was written by a female member of the Symbionese Liberation Army with feminist ideals, could the word "red" have been invoked for a deeper meaning. "The late 60s saw the emergence of the Women’s Movement in Britain. 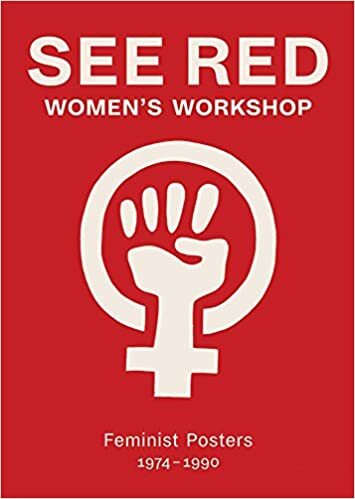 In 1969 in London the Women’s Red Liberation Workshop established itself, developing consciousness raising groups and attempting to articulate and understand the ways in which women felt themselves to be oppressed and exploited. In the same year, a group of socialist women active in the Vietnam Solidarity Campaign started producing a journal called “Socialist Woman”, whose aims were both to impress on the left the importance of the “Woman Question” – to publicise the struggles of women in Britain and internationally and to try to develop a socialist analysis of women’s oppression it was to be distributed through the newly formed Socialist Woman Groups". Redflagwalks. There was also the emergence of the socialist-feminist Red Rag Magazine championing women's rights. These publications inspired women internationally, including female Americans fighting for a better future. Were these publications and the rise of "red feminism", the catalyst for a push-back against the male chauvinist 'pigs' of America, including the Count Marco column of Marc H. Spinelli? Or did the Zodiac Killer undergo a complete transformation after murdering three women (5 people in total) - now rallying for "public sensibilities", despite being attributed with the threatening Exorcist letter just five months earlier? "the Red Phantom (red with rage)". The S.L.A letter: Dear Mr Editor, Did you know that the initials SLAY spell "sla", an old Norse word meaning "kill". a friend. 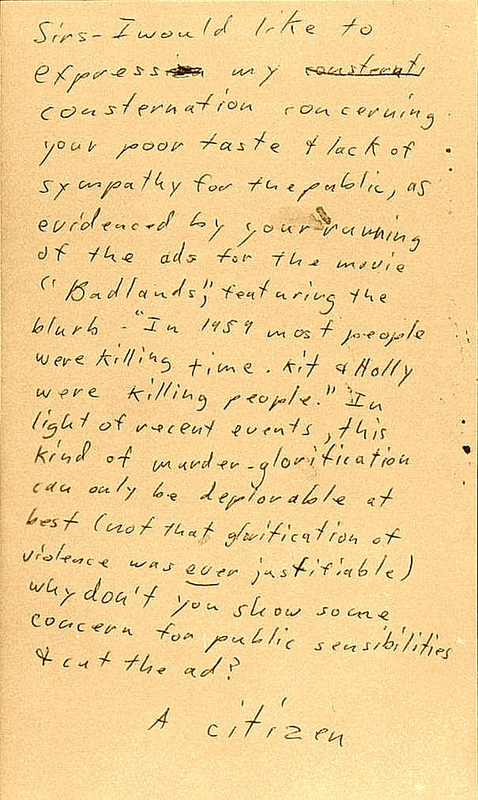 The Badlands card: Sirs -- I would like to expression my consternt (crossed out) consternation concerning your poor taste + lack of sympathy for the public, as evidenced by your running of the ads for the movie "Badlands," featuring the blurb: "In 1959 most people were killing time. Kit + Holly were killing people." In light of recent events, this kind of murder-glorification can only be deplorable at best (not that glorification of violence was ever justifiable) why don't you show some concern for public sensibilities + cut the ad? A citizen. The Red Phantom letter: Editor: Put Marco back in the hell-hole from whence it came- he has a serious psychological disorder- always needs to feel superior. I suggest you refer him to a shrink. Meanwhile, cancel the Count Marco column. Since the count can write anonymously, so can I----the Red Phantom (red with rage). Other than the psychological connection we touched upon in the Edward C. Adams article, what other possible reasons would the Zodiac Killer have for addressing Count Marco, a columnist who gave outrageous advice to women via the San Francisco Chronicle for 15 years. A murderer, who didn't give a second thought to shooting two women a total of 10 times, before also ruthlessly stabbing Cecelia Shepard in the back and abdomen 10 times, was now, just a few years later, objecting to "murder-glorification" and bigoted advise to women. A man devoid of empathy and driven by an insatiable ego had now become the proverbial "snowflake", quivering and upset because of an advice columnist and a film advertisement. Had the Zodiac Killer really achieved a complete transformation in just a matter of three years. If we believe the Exorcist letter as genuine Zodiac material, stating "If I do not see this note in your paper, I will do something nasty, which you know I'm capable of doing", then the transformation had occurred in just over 3 months. The Zodiac Killer could have been toying with the newspapers, disingenuously feigning concern while laughing at the authorities - or he was simply not the author of these banal communications that surfaced in 1974. The Symbionese Liberation Army didn't have unrealistic ideals, but unfortunately used contemptible means to achieve them. "In his manifesto "Symbionese Liberation Army Declaration of Revolutionary War & the Symbionese Program", Donald DeFreeze wrote, "The name 'symbionese' is taken from the word symbiosis and we define its meaning as a body of dissimilar bodies and organisms living in deep and loving harmony and partnership in the best interest of all within the body. "This political symbiosis DeFreeze describes means the unity of all left-wing struggles, feminist, anti-racist, anti-capitalist, and others. DeFreeze wanted all races, genders, and ages to fight together in a left-wing united front, and to live together peacefully". Wikipedia. ​With many female S.L.A members aligned with feminist ideals, would it be that difficult to believe, that the Red Phantom letter was aimed at Marc H. Spinelli (Count Marco) and his San Francisco Chronicle column because of its often belittling or denigrating comments towards women? ​"Betty Friedan, whose 1963 book The Feminine Mystique is credited with reviving the feminist movement, originally called the strike at the conference of the National Organization for Women in March. As head of the hastily assembled National Women's Strike Coalition, she had predicted an impressive turnout. Inevitably, the women had their detractors. The San Francisco Chronicle's Count Marco called the strike "a day of infamy and shame" and urged his supporters to wear black armbands "mourning the death of femininity." link. "Count Marco was an extremely popular columnist for the San Francisco Chronicle with an outrageous persona; this book of advice (Beauty and the Beast) on how to please a man was mainly for the ladies of "The Greatest Generation" and pre-boomers, whom it surely shocked and annoyed with its sexual frankness and its assumption that American women had everything to learn from European women; feminist readers now would be shocked by his assumption that women's lives are empty without masculine love and their main goal in life should be to please their "beasts." link. In other words, the Red Phantom letter was authored by a female member of the Symbionese Liberation Army (or a male member with a belief in feminism) in order to confront the opinionated columnist. I am not a staunch advocate of handwriting analysis due to its subjective nature and the fact it can be disguised, but here is the Red Phantom letter next to an extract taken from a Symbionese Liberation Army notebook - written before the kidnapping of Patricia Hearst on February 4th 1974. EDWARD C. ADAMS "YOU ARE NEXT"
A pasted card mimicking the '13 Hole' postcard was mailed to the home address of Dr. Edward C. Adams at 102 Camino Don Miguel, Orinda, California, postmarked October 17th 1970 from Berkeley. Edward C. Adams was a psychiatrist. The card read "Mon Oct 12, 1970. Edward Adams. The Zodiac is going to change the way of committing murders. I shall announce when I shall commit my murders, The Adamses are Next. you taught me to mean it. ADAMS YOU ARE NEXT. Zodiac." Fast forward to July 8th 1974, when another suspected Zodiac correspondence was mailed to Marc Henry Spinelli of the San Francisco Chronicle. He was better known as Count Marco, running an advice column in the paper for 15 years. The only time Zodiac addressed the columnist was in respect to a topic on psychiatrists and psychologists, which featured only five days prior to the July 8th 1974 'Red Phantom' letter. The column, dated July 3rd 1974, began with "When I wrote that psychiatrists and psychologists ruined more marriages than they saved, I wasn't surprised by the angry reaction. I had contended that shrinks look at ordinary marriage problems as "cases," to be dissected, rearranged and deranged, leaving the "patient" totally disoriented. What would happen if a physician examined a patient and said, "You have such and such a disease. Now do something about it," without prescribing treatment. Mother Nature is like an oyster. She heals emotional wounds through passage of time. An oyster finds a grain of sand has forced its way into the shell. As time goes on its mucous continually covers the irritant until eventually what was a sore spot becomes a magnificent pearl. However, if one instead took a sharp instrument and sliced the pearl in half, the only result would be to expose the original grain of sand, the irritant. According to a report in The Chronicle, behavioral researchers have shown unmistakably that psychiatry is a very imprecise tool in diagnosing mental illness". This clearly prompted a response from the author of the 'Red Phantom' letter, who wrote "Editor - Put Marco back in the hell-hole from whence it came - he has a serious psychological disorder - always needs to feel superior. I suggest you refer him to a shrink. Meanwhile, cancel the Count Marco column. Since the Count can write anonymously, so can I - the Red Phantom (red with rage)". Many people have attempted to analyze the Zodiac Killer from a psychological perspective, so is it possible the Zodiac Killer used his knowledge of this subject to play a game with his 'audience', throwing them red herrings throughout his communications? Directing the audience down a path he chose for them. ​"Edward C. Adams spent most of his life in the Bay Area where he attended the University of California Berkeley for his undergraduate work and Stanford University for his medical degree. His residency in psychiatry was received at the Menninger Clinic, Topeka, KS. During the Korean War he was an instructor in the Medical Field Service at Fort Sam Houston, San Antonio, TX. After retiring from an active practice in Psychiatry he devoted his energies to travel, fly fishing, the study of poetry and the enjoyment of his family and many friends. During the time spent at his Carmel home he volunteered as a docent at the Robinson Jeffers Foundation. He was a member of the San Francisco Psychoanalytic Society and an active supporter of many environmental groups". SFGATE.COM. One of the addresses for Marc H. Spinelli was 747 Geary Street, San Francisco, the location often associated with where taxicab driver Paul Stine picked up the Zodiac Killer on October 11th 1969. He would be murdered a short time later at the intersection of Washington and Cherry Streets. How well the Zodiac Killer knew this area is subjective, but he may have chosen this area because he was familiar with the surroundings - crucial when planning an escape route from a murder. Had the Zodiac Killer worked or trained, somewhere in or close to Presidio Heights. In the FBI document on the right, it is clear that Inspector David Toschi of homicide detail believed the 'You Are Next' card may have been mailed to Edward C. Adams by a former patient of his. However, if the card was mailed by the Zodiac Killer, what connections could he have to Edward C. Adams, his profession, or Orinda, California? The crucial phrase in the card is "you taught me to mean it". You don't teach patients, you diagnose them. What if the Zodiac Killer trained as a psychologist, or went to one of Edward C. Adams' seminars or lectures? He could easily have picked up some useful 'psychological advice', used to convince his audience in the guise of the Zodiac Killer - conveying his threats with menace and meaning. In other words, Edward C. Adams "taught him to mean it" under the Zodiac umbrella. Dr. Edward C. Adams was a member of the San Francisco Psychoanalytic Institute & Society. "The San Francisco Center for Psychoanalysis was organized in 2007, combining the San Francisco Psychoanalytic Institute & Society, founded in 1941, with the San Francisco Foundation for Psychoanalysis, founded in 1991. The Center provides an extensive training program in psychoanalysis. The Center also sponsors a large, vibrant Extension Division which offers classes and seminars to mental health professionals as well as to the general public." link.​ Was the Zodiac Killer sitting in the audience taking a lesson from Edward C. Adams in how "to mean it"? The San Francisco Psychoanalytic Society and Institute is a facility for psychoanalytic research, training, and education located on 2420 Sutter St. in San Francisco, California. It is situated in Lower Pacific Heights, approximately one mile from the intersection of Washington and Cherry. Extra reading on Zodiac Killer Site Forum.